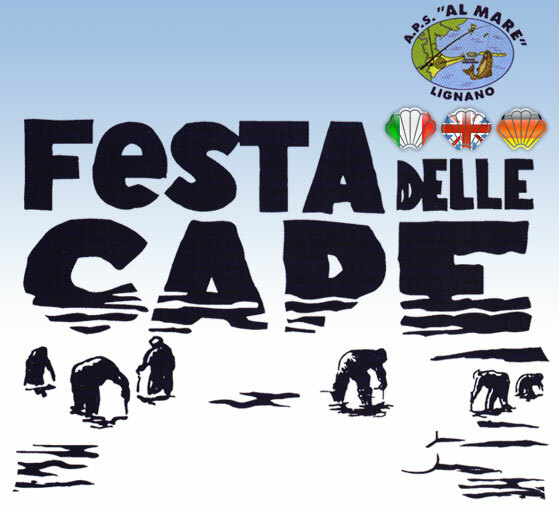 The “Mollusc Festival” (“Festa delle Cape”) was created in 1984 by a group of professional fishermen, and it was later carried on by the Fishermen Association A.P.S. “Al mare” of Lignano. The main purpose of this Festival is to introduce to both locals and tourists the great fish variety of our Northern Adriatic Sea. However, the most important thing about this Festival is that the entire proceeds go to charity or non-profit organizations. The Fishermen Association A.P.S. “Al mare” has been active for 30 years, thanks to the help of the Lignano city council, and especially of the local volunteers. Following the old recipe traditions, people who visit this Festival can enjoy a great variety of delicious fish dishes, like long molluscs (“cannolicchi”), pevarasse (clams), grilled or breaded sardines, baked sardines with onions (“sarde in saor”) and squids. During the past editions, the proceeds of this Festival have helped many non-profit organizations, such as “AGMEN”, the “Via di Natale” (which help cancer patients), the Organ Transplant Medical Centre, the Emergency Children “Bambini in emergenza” (children affected by cancer) and a few local families who’s children are affected by cancer. The Festival is organized in Lignano Pineta, Piazza d’Olivo. The Fishermen Association whish to thank the City Council and all the volunteers that have helped and will continue to help the carrying-out of this beautiful Festival.